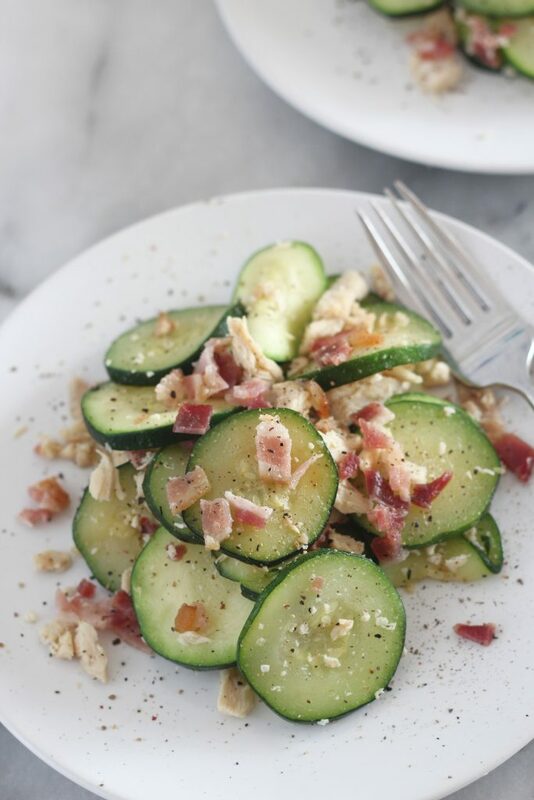 This low carb recipe for this quick zucchini, chicken and bacon dinner. It’s a great meal for busy weeknights! With the holidays here, I’m finding that I need to have my meals planned and prepped if I’m going to avoid carbs and sugar and not completely fall off the low carb wagon. 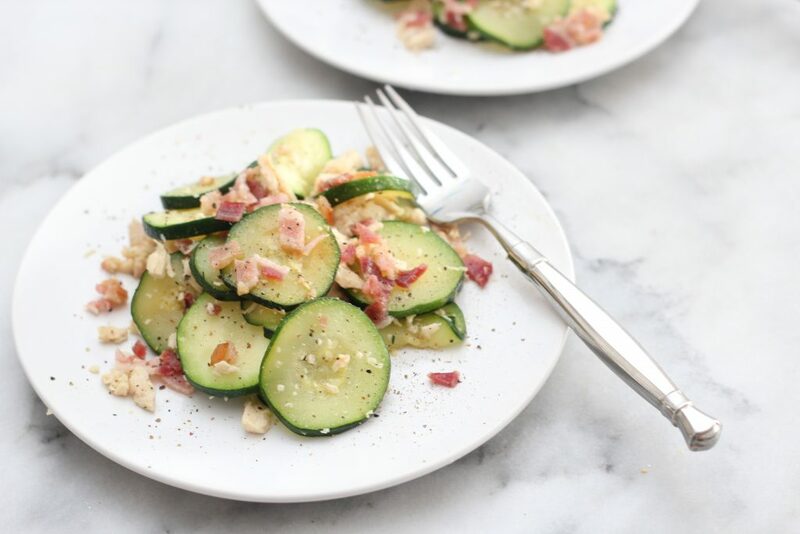 This quick low carb zucchini, chicken and bacon dish is simple and fast and tastes great for a weeknight meal. The whole family loves it! Having the chicken cooked ahead of time saves dinner multiple times a week. I kind of love chicken breast, so I eat it a ton. 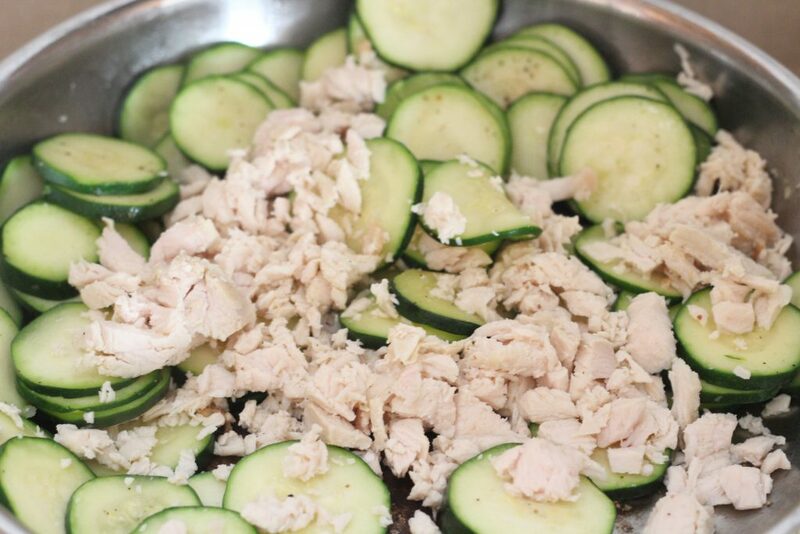 How to meal prep chicken breast in the Instant Pot or in the slow cooker! 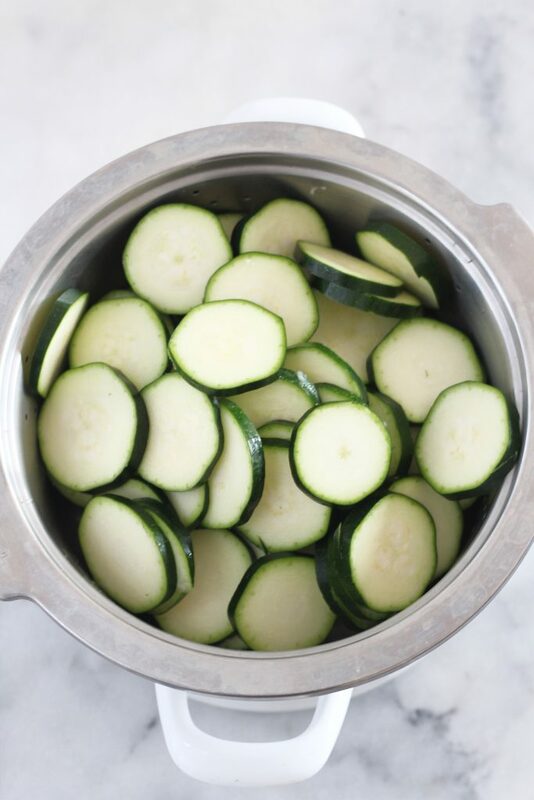 To avoid getting watery zucchini, it helps to lightly steam it before cooking and then letting the extra water drain for a few minutes. This is totally extra, but makes a difference! Sautéing all the ingredients together take just 10 minutes and dinner is on the table in under 30 minutes! Prepare bacon and crumble, reserving grease. While bacon is cooking, lightly steam the zucchini. Over medium heat, add a tablespoon of bacon grease to skillet. Toss in minced garlic and zucchini. 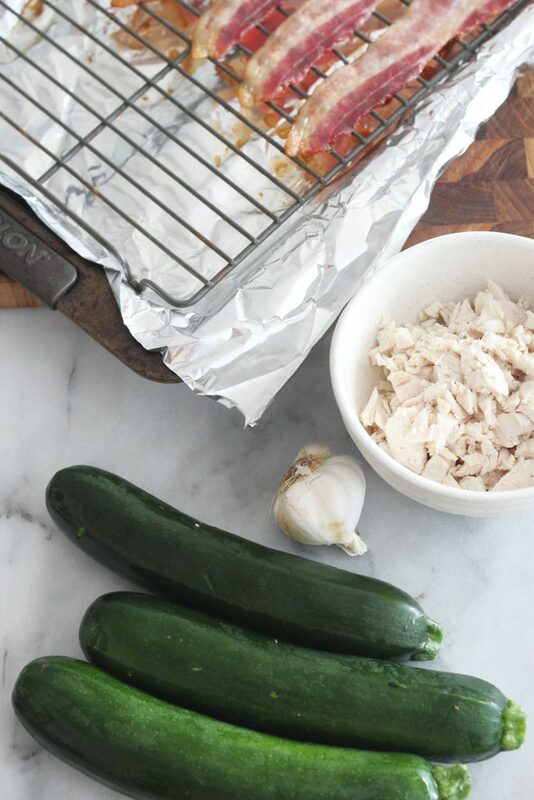 Cook zucchini until halfway softened, add in chicken breast and half of bacon add some pepper. Once zucchini is completely softened, remove from heat. 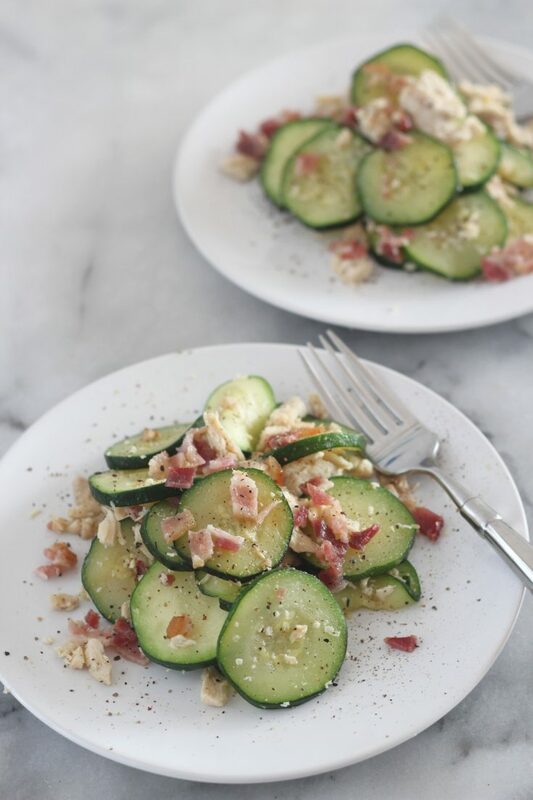 Crumble bacon over zucchini and serve. This looks delicious, we will really enjoy this recipe! Hope you are enjoying your week and thanks so much for sharing with us at Full Plate Thursday! Thank you for bringing tis to FF. We all need a simple low carb dinner these hectic and carrb laden days. Delicious and so easy. Thanks for sharing at FF. Looks delicious! Thanks for sharing with us at the To Grandma’s house we go link party, see you next week!